While promoting Captain America: Civil War during an event at Wizard World in New Orleans back in January 2016, Joe Russo said that they were breaking the story on Avengers: Infinity War, and they had a board with "67 characters" on it. That seemingly innocuous statement made headlines around the world, with the Russo Brothers ultimately walking back that exact number, although many fans went into Avengers: Infinity War literally expecting every MCU character to surface in the movie, but that was not the case at all. So we decided to delve through the 18 previous movies to determine which major characters didn't surface in Avengers: Infinity War. We have narrowed it down to 22 characters who have been introduced throughout the Marvel Cinematic Universe who weren't seen in Avengers: Infinity War, although some of whom were actually mentioned or talked about. The 22 we have picked out at least have a shot, we think, some greater than others, at returning in Avengers 4, for various reasons, while the Honorable Mentions seem less likely, although some may be back in stand alone sequels. Without further adieu, here are the 22 major Marvel Cinematic Universe characters who weren't featured in Avengers: Infinity War, starting with the two most obvious. Given his contributions in Captain America: Civil War, many assumed that Ant-Man a.k.a. Scott Lang (Paul Rudd) would show up in Avengers: Infinity War, but that didn't happen. 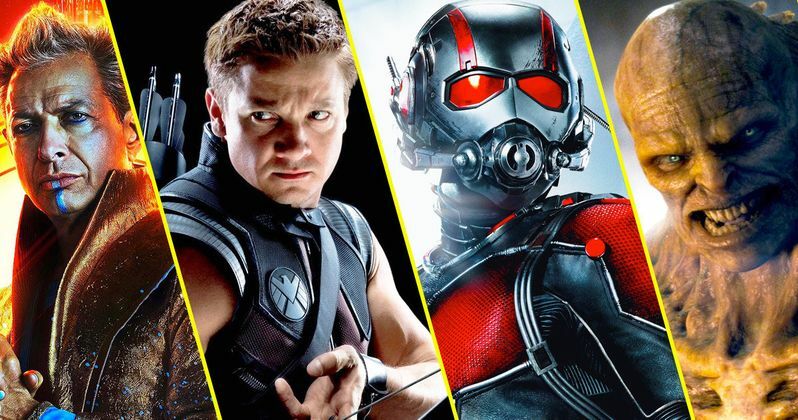 Black Widow did mention both Ant-Man and Hawkeye (Jeremy Renner) during one brief scene, stating they opted to stay with their families. It has been reported that Ant-Man and the Wasp (July 6) is set between Civil War and Infinity War, likely setting up Ant-Man's return in Avengers 4. Since it was already established that Hawkeye has a wife (Linda Cardellini) and kids to take care of, it wasn't terribly surprising that he chose to sit out Avengers: Infinity War and protect them. Hawkeye has already been confirmed for Avengers 4, with his new haircut and outfit suggesting that his family was killed by Thanos' actions, which likely motivates this stoic archer to return to join the Earth's Mightiest Heroes. The Wasp (Evangeline Lilly) is another character who has already been confirmed for Avengers 4, and we'll likely learn exactly what she was doing during Avengers: Infinity War during Ant-Man and the Wasp, which is said to overlap with the events of Infinity War. Given that this sequel brings back her long-lost mother Janet Van Dyne (Michelle Pfeiffer), it's understandable that she sat out this fight, but expect to see her back in action in Avengers 4. While some expected either Ant-Man or The Wasp to show up in Avengers: Infinity War, most weren't likely expecting their mentor (and The Wasp's father) Hank Pym (Michael Douglas) to make an appearance. Since Ant-Man and The Wasp sat this one out though, it makes sense that Pym does too, but while Ant-Man and the Wasp are expected to surface in Avengers 4, I can't see much of a reason for Pym to show up. Then again, with how little we know about the Avengers 4 story, anything is possible. After Secretary of State Thaddeus "Thunderbolt" Ross (William Hurt) made an unexpected return in 2016's Captain America: Civil War, and after it was confirmed he would return in Avengers: Infinity War, many wondered if his daughter, Betty Ross (Liv Tyler) was too far behind. While Betty still hasn't surfaced yet, she could be a character whose unexpected return adds some shock value to Avengers 4, like the surprise appearance of Red Skull in Infinity War. There has been no evidence (set photos, rumors, etc. ), perhaps she could be brought in at the last minute to provide some assistance with The Hulk (Mark Ruffalo).